Undoubtedly, the main entertainment of visitors to the picturesque resort is beach recreation. You can also diversify leisure activities by walking, visiting attractive shops and entertainment centers. One of the most beautiful places in the city is Garden of Villa Comunale (Parco Comunale di Taormina), which could be an ideal place for leisurely walks and admiring nature. In the garden, you can walk along convenient stone paths surrounded by dense thickets of exotic plants and flowers on all sides. There is also a small panoramic platform overlooking the coast where you can make some excellent memorable photos. The garden accommodates many beautiful old buildings, fountains and sculptures enjoying the constant attention of visitors. Active tourists who cannot imagine a good rest without workouts should think about visiting Palestra Quarus Center. A great gym, as well as daily aerobics classes, are always available to its clients. One of the best ways to appreciate the beauty of local landscapes is train trips. The local railway routes cover the most beautiful and remarkable attractions. Stroscio Gioielli Shop specializes in exclusive jewelry. Absolutely everyone - men, women, and the smallest clients - can choose suitable accessories here. Koh-I-Noor Jewelry is the best place to look for precious metal jewelry. Besides its chic jewelry with precious and semi-precious stones, it is glad to offer visitors a decent choice of stylish watches, as well as delightful icons made of gold and silver. Taormina is famous for its enchanting nightclubs, as well as stylish bars, and a true local attraction is Morgana Lounge Bar. The Renaissance-style bar's halls and spacious terraces are decorated with exquisite furniture and fresh flowers. Visitors to the bar can enjoy relaxing in a chic atmosphere, a huge selection of signature drinks and an interesting entertainment program. Daiquiri Bar is perfect for relaxing in a more peaceful atmosphere. It is located in the city's central square, in the immediate vicinity of the Cathedral of Taormina. Visitors to the bar can stay in a cozy room or go to its outdoor terrace offering a fantastic view of surrounding sights. Re di Bastoni Bar is an attractive place in all respects where a unique atmosphere of national color is created. It is housed in one of the beautiful historic buildings. The original natural-stone decoration and beamed ceilings have been preserved in its hall. The interior is complemented by handmade wooden furniture and bright paintings. The bar is sure to please gourmets: its menu is rich in exquisite national delicacies and refreshing cocktails. This guide on active recreation and leisure in Taormina is protected by the copyright law. You can re-publish this content with mandatory attribution: direct and active hyperlink to www.orangesmile.com. Guide to your best city break in Taormina - popular places for recreation and leisure. 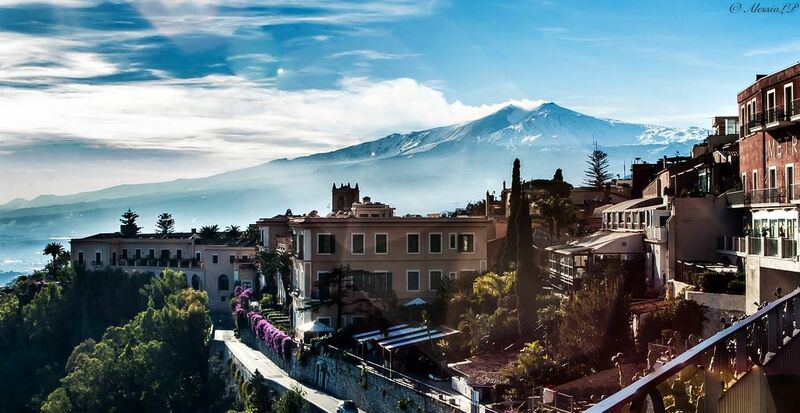 Things to do during the day in Taormina - attractions, parks, beaches, aquaparks, racing tracks, biking trails or waterski. Recommendations (with addresses, phone numbers and links) where to spend your time in the evening (bars, discos, clubs, etc.). We share some good ideas and the question 'What to do in Taormina?' disappears immediately.